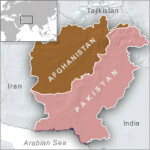 ISLAMABAD — Pakistan has formally reopened a major trade route with landlocked Afghanistan after nearly four years. Authorities had closed the remote Ghulam Khan border crossing in North Waziristan in 2014 after launching a major army-led counter-militancy offensive in the tribal district, once condemned as the “epicenter” of international terrorism. Military officials say the Waziristan region has since been almost completely secured and rehabilitation as well as reconstruction activities are currently under way there. Pakistani Prime Minister Shahid Khaqan Abbasi traveled to the tribal region on Monday and inaugurated a newly constructed terminal to formally resume cross-border trading activities. Ghulam Khan is the third-largest official crossing point on the nearly 2,600-kilometer, largely porous frontier between Pakistan and Afghanistan. Torkham and Chaman are the other two crossings that Afghans use for bilateral trade and transit through Pakistani land and sea routes. Additionally, the two installations are used by visitors traveling in either direction. The United States and NATO also rely heavily on Pakistan’s ground and air lines of communications for ferrying supplies and non-lethal military equipment to thousands of international troops stationed in Afghanistan. Pakistan’s relations with Afghanistan have deteriorated in recent years over mutual allegations of supporting militant attacks against each other. Political tensions often have prompted Pakistani authorities to abruptly close the Torkham and Chaman border crossings, reducing bilateral trade to just over $1 billion from $2.6 billion about two years ago. Officials and traders on both sides have welcomed resumption of trade through Ghulam Khan, hoping the move will help ease political tensions and increase bilateral trade. Afghan and Pakistani traders have long urged their respective governments to “segregate” business and trade ties from political and security tensions for promoting mutual trust. Lately, troubled relations have prompted Afghans to look for alternate routes and they have turned their attention to the India-funded Iranian port of Chabahar for transit trade, bypassing Pakistan. The Pakistani port of Karachi, however, is still the most economical route for Afghan transit trade, say business leaders in both countries. on lives of regular people of Afghanistan and Pakistan.